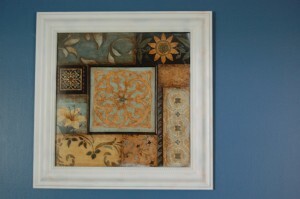 Last spring, I painted my family room. I had grown bored with the six-year-old wall color and the general look of the room, so out went the colors of my favorite football team, and in with something refreshing and “breezy”. The formerly burgundy room was transformed into a beachy oasis in which the tan flooring represented sand, the white bookcases and trim are the clouds, and the light blue walls are my cool, relaxing sky. As I finished the first roll of the paintbrush, a thought came to mind: I would no longer be able to use the Christmas decorations that I’ve collected over the years. The traditional red, gold, and green simply won’t fit in with the room’s new color scheme. With that realization, I knew I’d have to hit the stores soon in search of new Christmas decorations that would complement, not distract from, the family room’s new theme. As if sent from above, I saw and advertisement for a “make and take” Christmas ornament session at the local craft store. So, I hopped into my van with my youngest daughter in tow, so that we could get an idea of this year’s decorative trends and she could learn about the importance of being able to make something with her own hands. Get them started young if you can. Crafting can be therapeutic. My reward/craft for obediently trekking to the store in search of cool Christmas decorations on a hot, summer’s day? 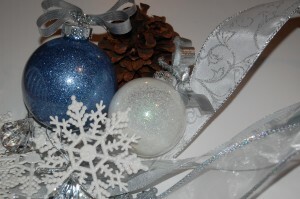 A beautiful clear ornament that was ultimately covered inside with light blue glitter and a pretty silver ribbon on the outside. I love it! 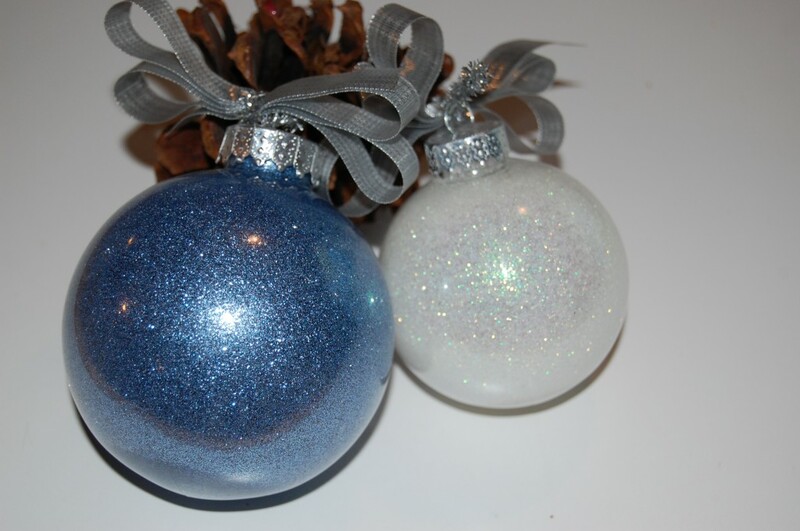 My daughter chose white glitter for the interior of her ornament and it is equally beautiful. Now, fully thinking about the work that I had ahead of me, I earnestly began my hunt for more decorations. Due to that dogged determination (I love to decorate! ), I soon found a supply of ribbons that was literally being stocked into bins as I perused the DIY aisle. It didn’t take long for me to make a few selections for my new color scheme. 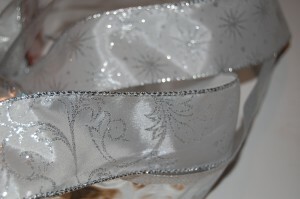 I am now the proud owner of 5 rolls of silver and white festive ribbon. Note to self: Need to brush up on ribbon-making skills for maximum decorative impact. Fast forward to tonight. This evening’s shopping trip turned up a set of snowflake ornaments that make an excellent addition to my small, but growing, collection of decorations for this year. So, here’s everything together. Obviously, I have my work cut out for me, but I love a challenge! For the robust decorative look that I prefer, I’ll need to make many more trips to see what great finds are out there just waiting for me to spruce up my newly decorated room for the upcoming holiday season. 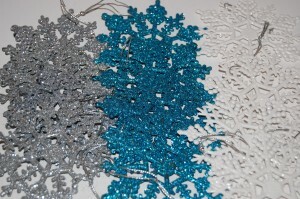 I’m also looking forward to making a few ornaments. One more thing: no Christmas decor would be complete without matching wrapping paper. You wouldn’t want to sabotage months of searching by using paper that doesn’t enhance the look, would you? Share your pictures of your Christmas decorations here.